I love the poetry of David Whyte. If you don’t know, he’s a Northwest poet, and one that specifically targets the squishy area of being in the business world. Poetry aimed to address and frame work, career, family life, and the mess that all adds up to. 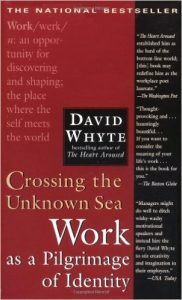 In his excellent book, Crossing the Unknown Sea, David has an excellent passage about returning home after a long day of work. Many of us have been on one side of this or the other. Either the money earner role, waiting for solace, or the homekeeper waiting for an adult to talk to. Its challenging to make this transition, regardless of which side. We pick up the topic on page 214. Voice and identity. During my graduate program at Seattle University, I was taught to pay attention to my voice. To my identity. To focus on those things that could slip by if you’re not aware of them. To engage, as much as you can, your intention. So its not that we can change our voice and identity before we enter our homes as if we could slip off our skin. It is more about paying attention to what we’re carrying in with us and dumping on those behind the door of our home, be it a dog, a family, a roommate, or the worst critic of all, ourselves. A terrific Wednesday Wisdom Action is found in Whyte’s suggestion to create “something timeless” for our homeward return. This would provide everyone a chance to find grounding, and establish the right voice and identity if it isn’t present. He suggests a ritual team time for adults and children; a glass of wine, or a cup of coffee, for the tired couple; a time for everyone to say how it went, or didn’t. One ritual I have, to enter the threshold to those I love with intention is to occasionally wait in the car until I’m ready to be present. What rituals do you practice before you pass the threshold from work to home? Or how do you greet those who are coming home?